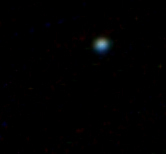 Chris Newsome captured the following image of Uranus on the 17th August 2005. It was taken with an ETX-105 and Meade LPI camera. The image is composed of 7 frames of 4 seconds each, stacked in K3CCDTools, and processed in Photoshop v7. Chris notes that the planet was well hidden in the light of the near full moon and also a bright sodium lit sky!